Classic Fountain Pens Are Both Terrific Everyday Writers As Well As Works Of Art In Their Own Right. If you are looking for the perfect symbiosis of Classical Fountain Pens then you have found what you are looking for ? Yes, you can with Lanier's Classic Fountain Pens. 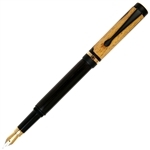 You’ll have a Classic Fountain Pen that offers a smart design at an affordable price. A Classical Fountain Pen is about the smooth flowing style, returning to a time honoured tradition. The classic design - perfectly shaped and distinctive - that is what admires of fine writing instruments. The Classic Fountain Pen is handmade out of one of the world’s most desired hardwoods, and trimmed in classy plating. Its light weight makes it one of the most-sought-after fountain pens as a writing instrument, while its aura of elegances makes it perfect for any ink pen collection. Our classic style fountain pens feature optional nib sizes include fine, medium and broad tips, a screw-on cap that fits the bottom and top of the pen for easy use and storage and they are available in either Brushed Satin or 24kt Gold plating. Your ink pen will also feature a clip and trim on the cap with the same plating option, complementing the wood you choose for your Classic Fountain Pen. The Classic Fountain Pen accepts universal size Private Reverse Sealed Ink Cartridges which are available in many colors ranging from Velvet Black to Naples Blue to Fiesta Red ink. When you choose the color ink cartridge you want in your ink pen, you can also purchase additional cartridges to make sure you don’t run out. You can also order bottles of fountain pen ink in Black, Blue, Green, Chocolat, Tanzanite, Red or Naples Blue to use with your fountain pen. In addition, you can select from two Fountain Pen Converters including the High-End Converter or Light Weight Converter. 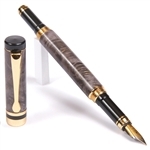 Engraving your Classic Fountain Pen is a snap for the staff here at Lanier, and personalizing your collector's item or present even further with a beautiful rosewood gift box can truly make this one of the most memorable items that anyone could ever hope to own.